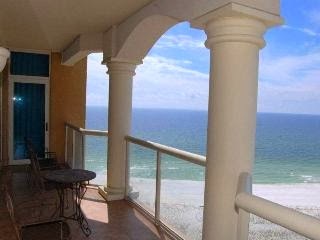 This luxurious Gulf Coast vacation home will greet you with breathtaking views when you stay at Portofino in Pensacola Beach Florida. Large floor-to-ceiling windows can be found in both bedrooms in this lovely condo. With a king bed in the master bedroom, a queen bed in the second bedroom and a queen sleeper sofa in the living room, this two bedroom condo can accommodate up to six people easily. You will feel right at home with amazing amenities such as a full kitchen, a washer and dryer and FREE wireless internet. Lounge on the sundeck surrounding the community pool and hot tub or play a friendly match on the tennis courts.